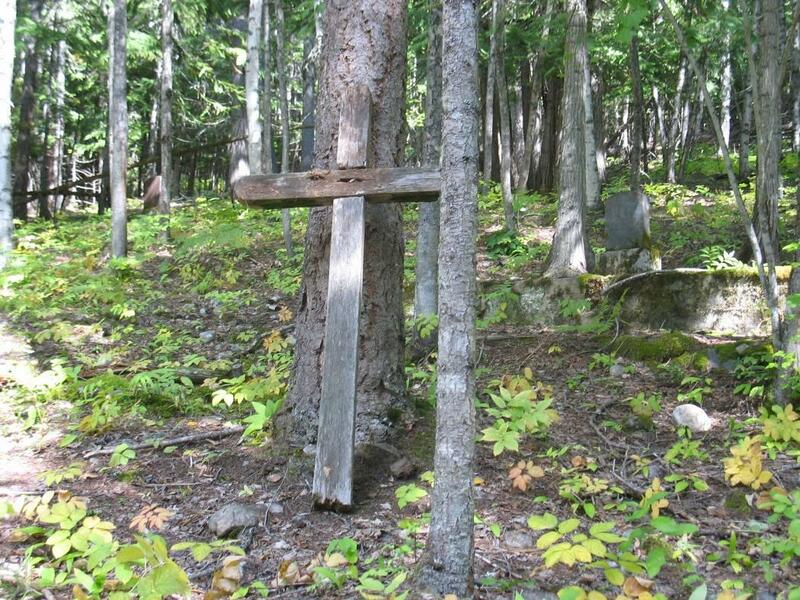 The following is a transcription of the Arrowhead Cemetery located in in Arrowhead, British Columbia, Canada. The community of Arrowhead was on the north end and east shore of the Arrow Lakes. It was initially surveyed in 1895. Arrowhead was the northern limit of year round navigation on the Columbia River, for at certain times of the year boats could not navigate the remaining way up the Columbia to reach Revelstoke. The Canadian Pacific Railway constructed a line to Arrowhead from Revelstoke in 1896. The site was the main trading centre for miners, loggers and farmers in the area. It boasted hotels, a number of general stores, a drug store, laundry, barber shop, grocery and butcher, a bank, two churches, school and a hospital along with two large sawmills. The community met its demise in the 1960's with the flooding of the valley by the Hugh Keenleyside Dam as a consequence of the Columbia River Treaty. Today there is little left of Arrowhead, some concrete remains of the buildings, the railway bed that can be seen when the Arrow Reservoir is low and the cemetery. The Arrowhead Cemetery site was being utilised as a burying ground by the 1890's, however it was not until 1908 when a plan of the cemetery was issued by O.B.N. Wilkie. The original plan done by Mr. Wilkie and a cemetery Registry Notebook are kept at the Revelstoke Museum & Archives located at 315 First St. West in Revelstoke, B.C. The original survey plan for the cemetery shows 313 plots (no. 255 was not numbered) in two sections, each seven plots wide, north and south of a 36 foot road allowance extending uphill eastward from the Arrowhead right-of-way northwest of the community. The site is approximately 1.6 acres in size. On the plan no graves appear in the first 14 rows of the cemetery, those being on the far east side of the cemetery. Therefore records begin at plot no. 197. 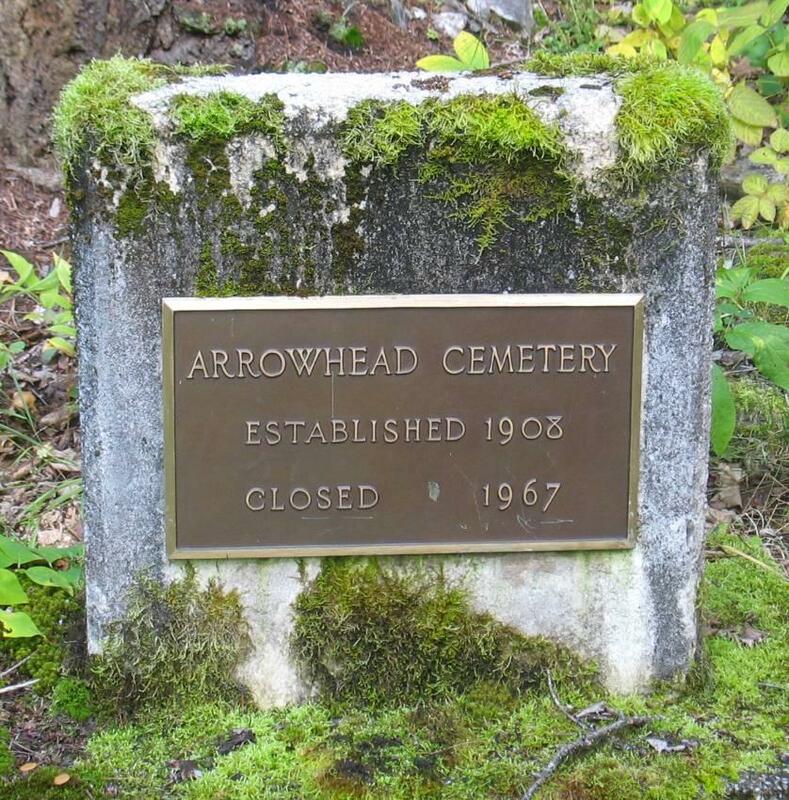 Unfortunately after Arrowhead began to decline in prosperity in the 1910's, control of the cemetery also lapsed. Consequently a number of graves were established north of the cemetery, outside of the original plan, on Crown land. Some of these graves have been discovered. Time and vegetation have taken their toll on the Arrowhead Cemetery. Today the site is overgrown with trees and little to no maintenance is done at the site. 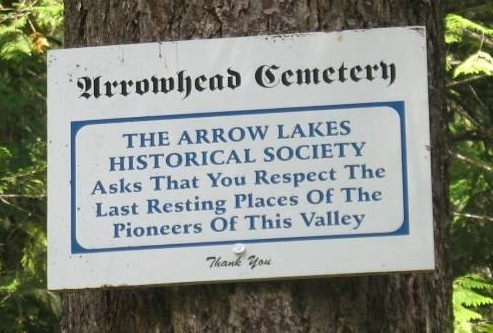 The Arrowhead Conservation Society has commissioned two reports; "Heritage Plants of a Ghost Town: Arrowhead, British Columbia" and "A Heritage Resource Assessment for the Historic Arrowhead Townsite and Cemetery, Arrowhead, British Columbia." These reports advocate for the protection and designation of this area for its historic values.The reports also identify measures that can be taken to protect the townsite and cemetery.The Arrowhead Conservation Society's purpose is to recognize Arrowhead as a heritage and conservation area and to provide an organization that will advocate for the protection and enhancement of the lands in and around the historic town site and cemetery of Arrowhead. The Arrowhead Cemetery is essentially inaccessible to the public today. 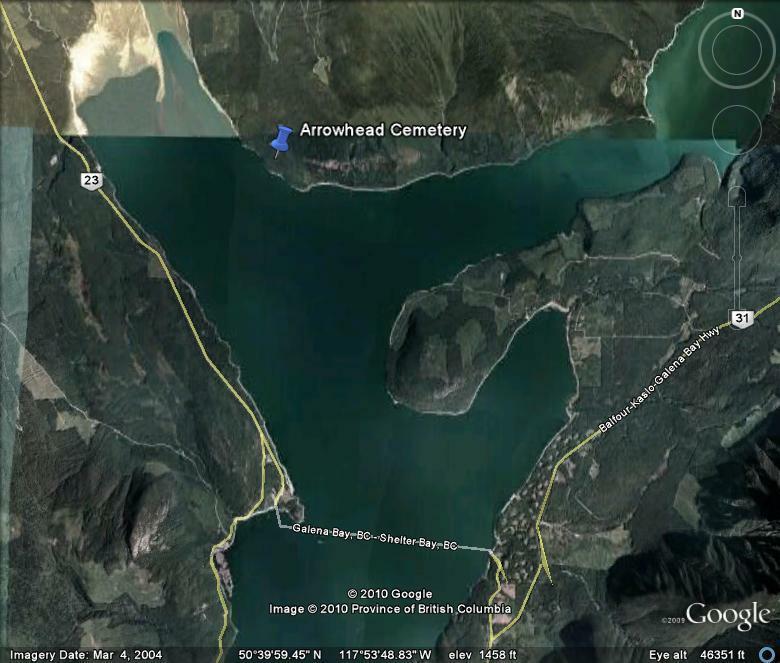 To reach the townsite and cemetery access is by boat from the Arrow Reservoir. 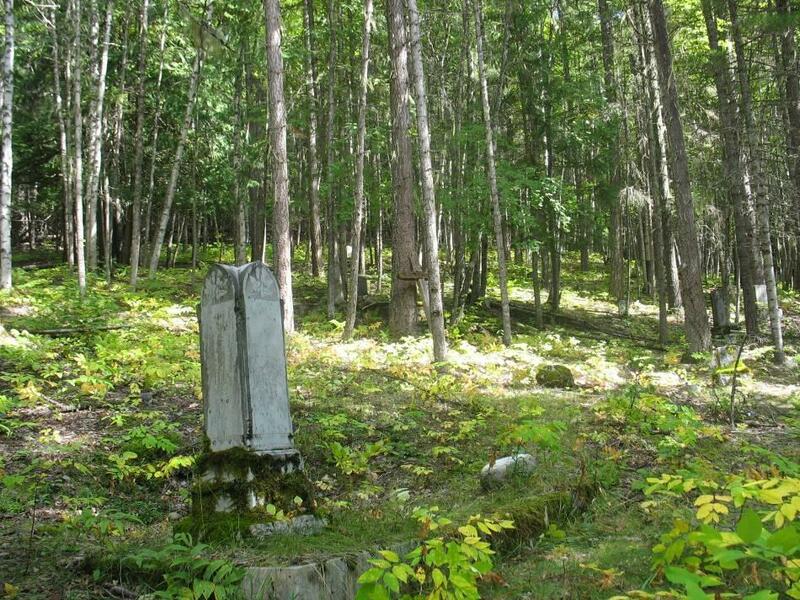 "Heritage Plants of a Ghost Town: Arrowhead, British Columbia"
"A Heritage Resource Assessment for the Historic Arrowhead Townsite and Cemetery, Arrowhead, British Columbia."